Other tools such as mendel_errors additional columns at the end. When queries are limited to variants in genes, the output will be in gene , chrom order as opposed to the usual gene , position order. As of version 0.16.0, the inheritance tools (autosomal_dominant, autosomal_recessive, comp_het, mendel_errors, de_novo) are now more strict by default. A –lenient flag allows, e.g. allows some samples to be of unknown phenotype or to not have both parents of known phenotype. The –allow-unaffected flag will result in reporting variants where unaffected samples share the same variants. The default will only report variants that are unique to affected samples. Candidate variants reported by the built-in inheritance model tools will appear in order by chromosome, then alphabetically by gene. In other words, they will not be in strict positional order for each chromosome. This is in an effort to group all candidate variants by gene since the gene is typically the atomic unit of interest. This flag is followed by a comma-delimited list of columns the user is requestin in the output. This is the number of families required to have a variant in the same gene in order for it to be reported. For example, we may only be interested in candidates where at least 4 families have a variant in that gene. By default, each tool will report all variants regardless of their putative functional impact. In order to apply additional constraints on the variants returned, one can use the --filter option. Using SQL syntax, conditions applied with the --filter options become WHERE clauses in the query issued to the GEMINI database. Filter variants that do not have at least this depth for all members in a a family. Default is 0. Filter variants that do not have at least this genotype quality for each sample in a family. Default is 0. Higher values are more stringent. By default, candidates that also appear in unaffected samples are not reported if this flag is specified, such variants will be reported. Loosen the restrictions on family structure. This will allow, for example, finding compound_hets in unaffected samples. In order to eliminate less confident genotypes, it is possible to enforce a maximum PL value for each sample. On this scale, lower values indicate more confidence that the called genotype is correct. 10 is a reasonable value. This is applied per-family such that all members of a family must meet this level in order to by reported in the final results. Many autosomal recessive disorders are caused by compound heterozygotes. Unlike canonical recessive sites where the same recessive allele is inherited from both parents at the _same_ site in the gene, compound heterozygotes occur when the individual’s phenotype is caused by two heterozygous recessive alleles at _different_ sites in a particular gene. We are looking for two (typically loss-of-function (LoF)) heterozygous variants impacting the same gene at different loci. The complicating factor is that this is _recessive_ and as such, we must also require that the consequential alleles at each heterozygous site were inherited on different chromosomes (one from each parent). Where possible, comp_hets will phase by transmission. Once this has been done, the comp_hets tool will provide a report of candidate compound heterozygotes for each sample/gene. Non-exonic/non-coding analyses: comp_hets excludes intronic/non-coding variants for which impact_severity == ‘LOW’ AND is_exonic == FALSE . Therefore, comp_hets will not retrieve most pairs of variants that are downstream or upstream of a gene or are intronic unless otherwise annotated with medium or high impact_severity . As of version 0.16.0 the comp_het tool will perform family-based phasing by default in order to provide better candidates even in the absence of unphased genotypes. Any candidate that could be one element of a comp_het will also be phaseable as long as the parents and their genotypes are known. As of version 0.16.1, the –ignore-phasing option is removed and there is no –lenient option. In 0.16.2, a –pattern-only flag was added to find compound hets by inheritance pattern without regard to affection status. A priority code was also added where variants with priority 1 are much more informative. See docs below for further information. All affected individuals must be heterozygous at both sites. No unaffected can be homozygous alterate at either site. Neither parent of an affected sample can be homozygous reference at both sites. No phased-unaffected can be heterozygous at both sites. unphased, unaffected that share the het pair are counted and reported for each candidate pair. Remove candidates where an affected from the same family does NOT share the same het pair. Sites are automatically phased by transmission when parents are present in order to remove false positive candidates. If data from one or both parents are unavailable and the child’s data was not phased prior to loading into GEMINI, all comp_het variant pairs will automatically be given at most priority == 2. If there’s only a single parent and both the parent and the affected are HET at both sites, the candidate will have priority 3. –max-priority x can be used to set the maximum allowed priority level at which candidate pairs are included in the output. n/a n/a H-H NO 2 singleton (unphaseable) HETs have priority 2. H-H UNK H-H NO 3 missing parent and all hets. R-R H-H H-H both NA phaseable, but alts are on the same chroms. candidates of priority == 3 are very unlikely (< 1%) to be causal for a rare Mendelian condition (see: http://www.ncbi.nlm.nih.gov/pmc/articles/PMC3734130/); we report them for completeness, but strongly recommend using priority 1 and 2 only. Priority 2 is useful when there are multiple families, some of which consist of only a single sequenced, affected sample. Kid must be HET at both sites. Kid must have alts on different chromosomes. Neither parent can be HOM_ALT at either site. If either parent is phased at both sites and matches the kid, it’s excluded. If either parent is HET at both sites, priority is reduced. When the above criteria are met, and both parents and kid are phased or parents are HET at different sites, the priority is 1. If both parents are not phased, the priority is 2. For every parent that’s a het at both sites, the priority is incremented by 1. The priority in a family is the minimum found among all kids. Each pair of consecutive lines in the output represent the two variants for a compound heterozygote in a give sample. The third column, comp_het_id , tracks the distinct compound heterozygote variant pairs. This indicates that samples child_3 and child_4 have a candidate compound heterozygotes in WASH.
(implausible de novo) kid is homozygoes. parents are same homozygotes and opposite to kid. If allow –only-affected is used, then the tools will only consider samples that have parents and are affected. The default is to consider any sample with parents. This tool will report the probability of a mendelian error in the final column that is derived from the genotype likelihoods if they are available. Where, here, we have required the called genotype to have at most a PL of 1 (lower is more confident). Note that the “violation” column indicates the type of mendelian error and the final column can be used for further filtering, with higher numbers indicating a greater probability of mendelian error. We have found > 0.99 to be a reasonable cutoff. db                    The name of the database to be queried. allowed for each sample in a family. --allow-unaffected    consider candidates that also appear in unaffected samples. [strict] warning if none of the affected samples have parents. If –allow-unaffected is specified, then the item prefixed [affected] is not required. Assuming you have defined the familial relationships between samples when loading your VCF into GEMINI, one can leverage a built-in tool for identifying de novo (a.k.a spontaneous) mutations that arise in offspring. The output will always start with the the requested columns followed by the 5 columns enumerated at the start of this document. However, in the absence of established parent/child relationships in the PED file, GEMINI will issue a WARNING, yet will attempt to identify autosomal recessive candidates for all samples marked as “affected”. [strict] if there are no affecteds that have a parent, a warning is issued. if –lenient is specified, the 2 points prefixed with “[strict]” are not required. if –allow-unaffected is specified, the point prefix with “[affected]” is not required. Assuming you have defined the familial relationships between samples when loading your VCF into GEMINI, one can leverage a built-in tool for identifying variants that meet an autosomal recessive inheritance pattern. The reported variants will be restricted to those variants having the potential to impact the function of affecting protein coding transcripts. $ gemini autosomal_recessive test.auto_rec.db --columns "chrom,start,end,gene"
The output will always start with the requested columns and end with the 5 extra columns enumerated at the start of this document. 0. version 0.16.0 changes the behavior of this tool to be more strict. To regain more lenient behavior, specify –lenient and –allow-unaffected. At least 1 affected must have 1 affected parent (or have no parents). If no affected has a parent, a warning is issued. [strict] All affecteds must have parents with known phenotype. If –lenient is specified, the items prefixed with “[strict]” are not required. If –allow-unaffected is specified, the item prefix with “[affected]” is not required. Note that for autosomal dominant –lenient allows singleton affecteds to be used to meet the –min-kindreds requirement if they are HET. If there is incomplete penetrance in the kindred (unaffected obligate carriers), these individuals currently must be coded as having unknown phenotype or as being affected. $ gemini autosomal_dominant test.auto_dom.db --columns "chrom,start,end,gene"
The gemini query tool allows querying by variant and the inheritance tools described above enable querying by gene for fixed inheritance patterns. The gene_wise tool allows querying by gene with custom genotype filters to bridge the gap between these tools. The –min-filters option means that we want all 3 of those filters to be met in a gene in order for variants in that gene to be reported. We can envision a scenario where we have 6 families (and 6 filters) and we want to report genes where 4 of them meet the filters. In that case, the query would have 6 –gt-filter s and –min-filters of 3. This differs from using gemini query with a single –gt-filter that combines each of those terms with an and because this allows each filter to be met in a different variant but in the same gene while the gemini query tool applies all elements of the single filter to each variant. Note that the first gene has the same variant for all 3 families, so we could have found this with the gemini query tool. However, for the HLA gene, each of the 3 filters passed in different variant so this would be missed by the query tool which only looks at a single variant at a time. As with the other tools, this tool orders by chromosome and gene and it applies WHERE (is_exonic = 1 AND impact_severity != ‘LOW’)” to the query. The variant_filters column shows which filters were passed by the variant. The n_gene_variants column shows how many variants in the gene are being reported. The gene_filter column shows which filters in the gene passed by any variant. Multiple –gt-filter-required filters can also be specified. Each filter added to this argument is required to pass for each variant and it does not contribute to the –min-filters argument. This can be used with, or instead of –gt-filter E.g. will required that all samples meet the minimum depth filter and then keep the subset of those that meet 2 out of the 3 –gt-filters . --where "(is_exonic = 1 or is_splicing = 1) AND impact_severity != 'LOW'"
Mapping genes to biological pathways is useful in understanding the function/role played by a gene. Likewise, genes involved in common pathways is helpful in understanding heterogeneous diseases. We have integrated the KEGG pathway mapping for gene variants, to explain/annotate variation. This requires your VCF be annotated with either snpEff/VEP. Here, -v specifies the version of the Ensembl genes used to build the KEGG pathway map. Hence, use versions that match the VEP/snpEff versions of the annotated vcf for correctness. For e.g VEP v2.6 and snpEff v3.1 use Ensembl 68 version of the genomes. By default, all gene variants that map to pathways are reported. However, one may want to restrict the analysis to LoF variants using the --lof option. Integrating the knowledge of the known protein-protein interactions would be useful in explaining variation data. Meaning to say that a damaging variant in an interacting partner of a potential protein may be equally interesting as the protein itself. We have used the HPRD binary interaction data to build a p-p network graph which can be explored by GEMINI. Use this option to restrict your analysis to only LoF variants. Meaning to say return all LoF gene TGM2 (in sample M128215) interacting partners to a 3rd order of interaction. Not all candidate LoF variants are created equal. For e.g, a nonsense (stop gain) variant impacting the first 5% of a polypeptide is far more likely to be deleterious than one affecting the last 5%. Assuming you’ve annotated your VCF with snpEff v3.0+, the lof_sieve tool reports the fractional position (e.g. 0.05 for the first 5%) of the mutation in the amino acid sequence. In addition, it also reports the predicted function of the transcript so that one can segregate candidate LoF variants that affect protein_coding transcripts from processed RNA, etc. Occassionally one may need to update the sample information stored in the samples table. The amend tool allows one to provide an updated PED file as input and it will update each sample_id in the PED file that matches a sample_id. Now, let’s say you realized that the dad is also affected and you want to correct the samples table accordingly. You would first edit the PED file and then run the amend tool using the updated PED. It is inevitable that researchers will want to enhance the gemini framework with their own, custom annotations. gemini provides a sub-command called annotate for exactly this purpose. As long as you provide a tabix‘ed annotation file in BED or VCF format, the annotate tool will, for each variant in the variants table, screen for overlaps in your annotation file and update a one or more new column in the variants table that you may specify on the command line. This is best illustrated by example. Let’s assume you have already created a gemini database of a VCF file using the load module. Now, let’s imagine you have an annotated file in BED format (important.bed) that describes regions of the genome that are particularly relevant to your lab’s research. You would like to annotate in the gemini database which variants overlap these crucial regions. We want to store this knowledge in a new column in the variants table called important_variant that tracks whether a given variant overlapped (1) or did not overlap (0) intervals in your annotation file. Formerly, the -a option was the -t option. Now, you can use this TABIX’ed file to annotate which variants overlap your important regions. In the example below, the results will be stored in a new column called “important”. The -t boolean option says that you just want to track whether (1) or not (0) the variant overlapped one or more of your regions. Since a new columns has been created in the database, we can now directly query the new column. In the example results below, the first and third variants overlapped a crucial region while the second did not. Instead of a simple yes or no, we can use the -t count option to count how many important regions a variant overlapped. It turns out that the 3rd variant actually overlapped two important regions. Lastly, we may also extract values from specific fields in a BED file (or from the INFO field in a VCF) and populate one or more new columns in the database based on overlaps with the annotation file and the values of the fields therein. To do this, we use the -a extract option. This is best described with an example. To set this up, let’s imagine that we have a VCF file from a different experiment and we want to annotate the variants in our GEMINI database with the allele frequency and depth tags from the INFO fields for the same variants in this other VCF file. (optionally) the name of the column we want to add (-c), if this is not specified, it will use the value from -e.
For example, let’s imagine we want to create a new column called “other_allele_freq” using the AF field in our VCF file to populate it. This create a new column in my.db called other_allele_freq and this new column will be a FLOAT. In the event of multiple records in the VCF file overlapping a variant in the database, the average (mean) of the allele frequencies values from the VCF file will be used. The -t option is only valid when using the -a extract option. -o mean. Compute the average of the values. They must be numeric. -o median. Compute the median of the values. They must be numeric. -o min. Compute the minimum of the values. They must be numeric. -o max. Compute the maximum of the values. They must be numeric. -o mode. Compute the maximum of the values. They must be numeric. -o first. Use the value from the first record in the annotation file. -o last. Use the value from the last record in the annotation file. -o sum. Compute the sum of the values. They must be numeric. The -o option is only valid when using the -a extract option. Missing values are allowed since we expect that in some cases an annotation VCF will not have all INFO fields specified for all variants. We recommend decomposing and normalizing variants before annotating. See Step 1. split, left-align, and trim variants for a detailed explanation of how to do this. One can also extract and populate multiple columns at once by providing comma-separated lists (no spaces) of column names (-c), types (-t), numbers (-e), and summary operations (-o). For example, recall that in the VCF example above, we created a TABIX’ed BED file containg the allele frequency and depth values from the INFO field as the 4th and 5th columns in the BED, respectively. Or, one can extract variants based on a specific gene name. 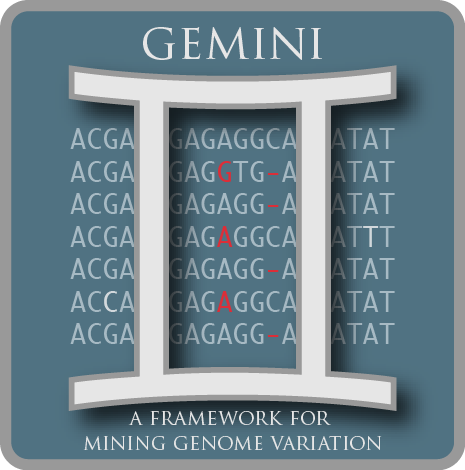 gemini includes a convenient tool for computing variation metrics across genomic windows (both fixed and sliding). Here are a few examples to whet your appetite. If you’re still hungry, contact us. Compute the average nucleotide diversity for all variants found in non-overlapping, 50Kb windows. Compute the average nucleotide diversity for all variants found in 50Kb windows that overlap by 10kb. Compute the transition/transversion ratios for the snps in the coding regions. Compute the transition/transversion ratios for the snps in the non-coding regions. Compute the type and count of the snps. Calculate the site frequency spectrum of the variants. To calculate the P-value using a permutation test, use the --permutations option, specifying the number of permutations of the case/control labels you want to use. By default, all variants affecting a given gene will be included in the C-alpha computation. However, one may establish alternate allele frequency boundaries for the variants included using the --min-aaf and --max-aaf options. If you would rather consider all nonsynonymous variants for the C-alpha test rather than just the medium and high impact variants, add the --nonsynonymous flag. Runs of homozygosity are long stretches of homozygous genotypes that reflect segments shared identically by descent and are a result of consanguinity or natural selection. Consanguinity elevates the occurrence of rare recessive diseases (e.g. cystic fibrosis) that represent homozygotes for strongly deleterious mutations. Hence, the identification of these runs holds medical value. The ‘roh’ tool in GEMINI returns runs of homozygosity identified in whole genome data. The tool basically looks at every homozygous position on the chromosome as a possible start site for the run and looks for those that could give rise to a potentially long stretch of homozygous genotypes. As you can see, the immediate homozygous position right of a break (h or u) would be the possible start of a new roh run and genotypes to the left of a break are pruned since they cannot be part of a longer run than we have seen before. Return roh with minimum of 50 snps, a minimum run length of 1 mb and a minimum sample depth of 20 for sample S138 (with default values for allowed number of HETS, UNKS and total depth). Somatic mutations in a tumor-normal pair are variants that are present in the tumor but not in the normal sample. By default, set_somatic simply marks variants that are genotyped as homozygous reference in the normal sample and non-reference in the tumor. More stringent somatic filtering criteria are available through tunable command line parameters. The minimum required combined depth for tumor and normal samples. The minimum required variant quality score. The minimum required somatic score (SSC). This score is produced by various somatic variant detection algorithms including SpeedSeq, SomaticSniper, and VarScan 2. The maximum frequency of the alternate allele allowed in the normal sample. The maximum count of the alternate allele allowed in the normal sample. The minimum depth required in the normal sample. The minimum frequency of the alternate allele required in the tumor sample. The minimum count of the alternate allele required in the tumor sample. The minimum depth required in the tumor sample. A specific chromosome on which to flag somatic mutations. Don’t set the is_somatic flag, just report what _would_ be set. For testing purposes. Actionable mutations are somatic variants in COSMIC cancer census genes with medium or high impact severity predictions. This tool reports actionable mutations as well as their known drug interactions (if any) from DGIdb. Current functionality is only for SNVs and indels. Report putative somatic gene fusions from structural variants in a tumor-normal pair. Putative fusions join two genes and preserve transcript strand orientation. By default, fusions reports structural variants that are flagged as somatic, join two different genes, and preserve transcript strand orientation. These may be further filtered using tunable command line parameters. The required supporting evidence types for the variant from LUMPY (“PE”, “SR”, or “PE,SR”). Require at least one of the affected genes to be in the COSMIC cancer gene census. gene_wise: Custom genotype filtering by gene. -a boolean Did a variant overlap a region or not? -a count How many regions did a variant overlap? Extracting and populating multiple columns at once.